This study investigated the effect of unilateral occlusal elevation in the molar region on facial and mandibular development in growing rats. Thirty 5-week-old male Wistar rats were randomly allocated to three groups (n = 10). The control group was allowed to develop naturally until 9 weeks of age. A device fitted on the caused unilateral occlusal elevation at 5 weeks in the removal group. The device was removed at 7 weeks and the rats were observed until 9 weeks. In the continuation group, the same device fitted on the left-side molars caused unilateral occlusal elevation continuously for 9 weeks. All groups underwent craniofacial scanning with three-dimensional micro-computed tomography at 5, 7, and 9 weeks. In the removal and continuation groups, the mandible was displaced to the unelevated side. At 7 weeks, both these groups showed greater skeletal growth and molar extrusion on the elevated side, with significant differences between the elevated and unelevated sides. At 9 weeks, there were significant differences in both skeletal and alveolar growth between these groups; the asymmetry ameliorated in the removal group. We evaluated three-dimensional morphometry by fitting a device to rat molars for a short observation period; thus, future studies are warranted to acquire data following long-term observation. Unilateral occlusal elevation during the growth period suppressed molar eruption and extrusion on the elevated and unelevated sides, respectively. The height of the mandibular ramus increased on the elevated side, resulting in asymmetric growth. Keywords: X-Ray microtomography, Molar, Malocclusion, Facial asymmetry, Orthopedics, Orthodontics, Growth. © 2019 Morohoshi et al. Facial asymmetry is a morphological abnormality in the frontal orientation and is one of the indications for orthodontic treatment. Genetic factors are primarily believed to be responsible for facial asymmetry [1Nicot R, Hottenstein M, Raoul G, et al. Nodal pathway genes are down-regulated in facial asymmetry. J Craniofac Surg 2014; 25(6): e548-55. [PMID: 25364968] -4Quinto-Sánchez M, Muñoz-Muñoz F, Gomez-Valdes J, et al. Developmental pathways inferred from modularity, morphological integration and fluctuating asymmetry patterns in the human face Sci Rep 2018; 17; 8: 963. [http://dx.doi.org/10.1038/s41598-018-19324-y] ]. Other factors include tooth related factors such as cross-bite during the growth period [5Rodrigues VP, Freitas BV, de Oliveira ICV, Dos Santos PCF, de Melo HVF, Bosio J. Tooth loss and craniofacial factors associated with changes in mandibular condylar morphology. Cranio 2018; 29: 1-7. [PMID: 29376479] -13Nakano H, Maki K, Shibasaki Y, Miller AJ. Three-dimensional changes in the condyle during development of an asymmetrical mandible in a rat: A microcomputed tomography study. Am J Orthod Dentofacial Orthop 2004; 126(4): 410-20. [http://dx.doi.org/10.1016/j.ajodo.2004.04.016] [PMID: 15470344] ], abnormal masticatory muscle activity, and persistent exter nal force on the mandible [14Bresin A. Effects of masticatory muscle function and bite-raising on mandibular morphology in the growing rat. Swed Dent J Suppl 2001; 150(150): 1-49. [PMID: 11803646] -20Ishii T, Yamaguchi H. Influence of extraoral lateral force loading on the mandible in the mandibular development of growing rats. Am J Orthod Dentofacial Orthop 2008; 134(6): 782-91. [http://dx.doi.org/10.1016/j.ajodo.2006.10.032] [PMID: 19061805] ]. Mandibular head arthritis during young age, due to attenuation of muscular strength on one side and loss of molars, particularly during the growth period, results in facial asymmetry [5Rodrigues VP, Freitas BV, de Oliveira ICV, Dos Santos PCF, de Melo HVF, Bosio J. Tooth loss and craniofacial factors associated with changes in mandibular condylar morphology. Cranio 2018; 29: 1-7. [PMID: 29376479] , 15Seok H, Kim SG. Correction of malocclusion by botulinum neurotoxin injection into masticatory muscles. Toxins (Basel) 2018; 10(1): E27. [http://dx.doi.org/10.3390/toxins10010027] [PMID: 29301317] -17Felix VB, Cabral DR, de Almeida AB, Soares ED, de Moraes Fernandes KJ. Ankylosis of the temporomandibular joint and reconstruction with a costochondral graft in a patient with juvenile idiopathic arthritis. J Craniofac Surg 2017; 28(1): 203-6. [http://dx.doi.org/10.1097/SCS.0000000000003266] [PMID: 27930 467] ]. In animal experiments, rats fitted with an inclined plate in the incisor region have been shown to develop facial asymmetry [13Nakano H, Maki K, Shibasaki Y, Miller AJ. Three-dimensional changes in the condyle during development of an asymmetrical mandible in a rat: A microcomputed tomography study. Am J Orthod Dentofacial Orthop 2004; 126(4): 410-20. 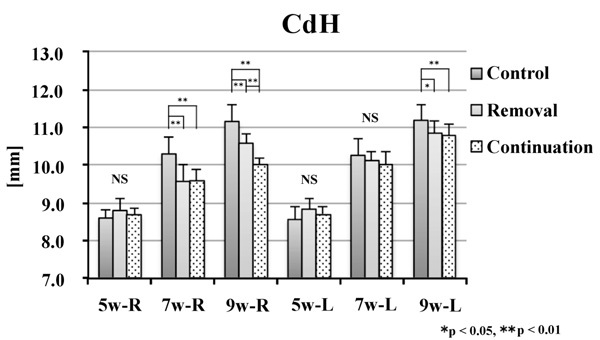 [http://dx.doi.org/10.1016/j.ajodo.2004.04.016] [PMID: 15470344] , 20Ishii T, Yamaguchi H. Influence of extraoral lateral force loading on the mandible in the mandibular development of growing rats. Am J Orthod Dentofacial Orthop 2008; 134(6): 782-91. [http://dx.doi.org/10.1016/j.ajodo.2006.10.032] [PMID: 19061805] ], and the mandible was shown to develop lateral displacement during growth [5Rodrigues VP, Freitas BV, de Oliveira ICV, Dos Santos PCF, de Melo HVF, Bosio J. Tooth loss and craniofacial factors associated with changes in mandibular condylar morphology. Cranio 2018; 29: 1-7. [PMID: 29376479] , 7Veli I, Uysal T, Ozer T, Ucar FI, Eruz M. Mandibular asymmetry in unilateral and bilateral posterior crossbite patients using cone-beam computed tomography. Angle Orthod 2011; 81(6): 966-74. [http://dx.doi.org/10.2319/022011-122.1] [PMID: 21591969] , 10Fuentes MA, Opperman LA, Buschang P, Bellinger LL, Carlson DS, Hinton RJ. Lateral functional shift of the mandible: Part I. Effects on condylar cartilage thickness and proliferation. Am J Orthod Dentofacial Orthop 2003; 123(2): 153-9. [http://dx.doi.org/10.1067/mod.2003.5] [PMID: 12594421] -13Nakano H, Maki K, Shibasaki Y, Miller AJ. Three-dimensional changes in the condyle during development of an asymmetrical mandible in a rat: A microcomputed tomography study. Am J Orthod Dentofacial Orthop 2004; 126(4): 410-20. [http://dx.doi.org/10.1016/j.ajodo.2004.04.016] [PMID: 15470344] , 20Ishii T, Yamaguchi H. Influence of extraoral lateral force loading on the mandible in the mandibular development of growing rats. Am J Orthod Dentofacial Orthop 2008; 134(6): 782-91. [http://dx.doi.org/10.1016/j.ajodo.2006.10.032] [PMID: 19061805] ]. However, there have been a few reports regarding the growth changes after the removal of the causative device. Diagram of random group allocation in this study. The objective of this study was to investigate the morphological effect of functional factors in the oral cavity on maxillomandibular development. We hypothesized that the unilateral molar occlusal elevation induces asymmetry and attempted to elucidate growth changes in the jawbone and face in a growing rat model. In addition, when temporary unilateral elevation was improved, it was proved that growth of the discordant articular processes and alveolar bone due to teeth eruption become normal, and facial asymmetry recovered. Thirty Wistar male rats were used. All animal experiments were conducted in accordance with the Guidelines for the Treatment of Experimental Animals at the Tokyo Dental College (approval no. 23202). The experiments were initiated when the rats were 5 weeks of age. All rats were randomly allocated to three groups (n = 10) at the start of the experiment. Rats in the first group were allowed to develop naturally until 9 weeks of age (the control group). Rats in the second group had a device fitted on the maxillary left molars for unilateral occlusal elevation at 5 weeks of age. The device was removed at 7 weeks of age, and the rats were reared to 9 weeks of age (the removal group). 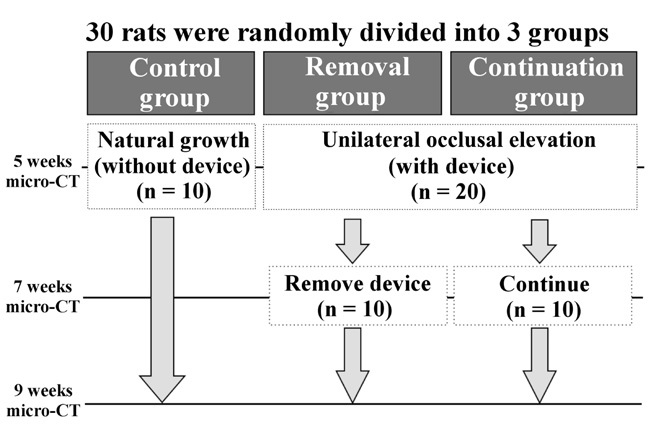 Rats in the final group (the continuation group) had the same device fitted on the maxillary left molars to unilaterally elevate the occlusion at 5 weeks of age; however, in this group the device was left for continuous unilateral occlusal elevation until 9 weeks of age (Fig. 1 ). A 2 mm thick, 3.5 mm long, and 1.5 mm wide metal bracket buccal tube (Buccal Tubes; Tomy Incorporated, Tokyo, Japan) was affixed with superglue (Super Bond; Sun Medical, Shiga, Japan) to the left molar occlusal surface of rats in the experimental groups after acid etching for 30 s with 65% phosphoric acid (Fig. 2A, B ). The experimental animals were maintained in the following environmental conditions: 23°C room temperature, 60% humidity, and 12 h light/dark cycle. These breeding conditions do not change with the basic settings of the animal experiment facility. Before the device was fitted, the animals were initially fed with solid chow, which was replaced with powdered chow after the device was fitted. All the rats were weighed at 5, 7, and 9 weeks of age to record their growth and assess their nutritional status. The animals were sacrificed with an intraperitoneally administered overdose of thiopental (Ravonal; Tanabemitsubishi Pharmaceutical, Osaka, Japan). Unilateral occlusal elevation device in the maxillary left molar region. A: Metal buccal tube (arrow) fitted in the maxillary left molar region. B: Frontal section of the maxillary molar region. All rats underwent craniofacial scanning using a laboratory animal micro-CT system at 5, 7, and 9 weeks of age. Before CT scanning, general anesthesia was induced in the rats using an intraperitoneal injection (0.5 mL) of 0.3-g thiopental diluted twofold with injection solvent to render appropriate sedation. Micro-CT scanning was performed under the following conditions using the HMX225-Actis+4 (Tesco, Tokyo, Japan): tube voltage 90 kV, tube current 50 μA, slice thickness 0.05 mm, magnification 2.0×, and exposure duration 17 s. The slice images acquired were reconstructed in three dimensions with three-dimensional (3D) reconstruction software (TRI-3D-BON; Ratoc System Engineering, Tokyo, Japan). These reconstructions were converted into surface images using a 3D image measurement software (Imageware version 12.0; Tokyo Boeki Techno-System, Tokyo, Japan). These were used to measure vertical and horizontal distances between the defined craniometric points, lines, and planes; the extent of molar extrusion; and other parameters. 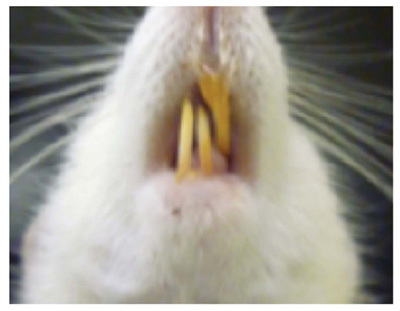 The points and planes used for measurement were based on those reported by Ishii [20Ishii T, Yamaguchi H. Influence of extraoral lateral force loading on the mandible in the mandibular development of growing rats. Am J Orthod Dentofacial Orthop 2008; 134(6): 782-91. [http://dx.doi.org/10.1016/j.ajodo.2006.10.032] [PMID: 19061805] ]. For morphological measurements of the mandible, a mandibular plane was created on the 3D-reconstructed mandible. The points of intersection between this mandibular plane and the mandible were the Menton (Me) and antegonion; the line passing through these two points was defined as the mandibular border reference line. The Lower Alveolar (LA) craniometric point in the mandibular alveolar region was defined as the anteriormost boundary point between the mandibular molars and the anterior crest of the alveolar bone. The Lower Molar (LM) craniometric point was defined by considering the tip of the mesiobuccal cusp of the second molar as the reference point. The mandibular ramus craniometric point was defined in terms of the Condylion (Cd) with respect to the central mandibular process (Fig. 3A ). The vertical distance between the mandibular molars and the mandibular bone was determined by measuring the distance from the LA, LM, and Cd reference points to the mandibular border plane, and these were denoted as the Lower Alveolar Height (LAH), Lower Molar Height (LMH), and Condylar Height (CdH), respectively. The mandibular horizontal distance (Me–Cd) was measured as the distance between Me and Cd (Fig. 3B ). The maxilla was morphologically measured by first defining the maxillary plane as the reference plane that includes three reference points of the anteriormost point of the nasal suture (Na) and the posteriormost border of the right Zygomatic arches (rZt) and left Zygomatic arches (lZt) (Fig. 4A ). The Upper Molar Height (UMH) was defined as the vertical distance from the maxillary plane to the upper molar and the tip of the mesiobuccal cusp of the second molar (Fig. 4B ). A left–right comparison of the data obtained from these measurements was made within groups using a paired t-test for each group (n = 10). Bartlett’s test was performed to confirm the normality. As a result, population variance was found to be equal for all groups. A nonrepeated measures analysis of variance was used to compare various measurements between the three groups, after which the Bonferroni’s method was used for multiple comparisons. Changes in body weight were determined using multiple comparisons (Tukey–Kramer) for each group at three points (5, 7, and 9 weeks). When the detection power and the significance level were assumed to be 95% and 5%, respectively, for verifying the number of samples, the effective sample size was 3.47. In this case, the sample size was 96.29% when n = 3 and 71.32% when n = 2. Therefore, as the sample size in each group was n = 10, the sample size necessary for statistical analyses was assumed to be sufficient. Data analyses were performed using Microsoft Excel 2011 (Microsoft Corp., Redmond, WA, USA). Left–right comparison within the control group (n = 10). Mandibular lateral displacement in the removal group at 7 weeks of age. Macroscopic observation revealed that, in the control group, the midlines of the maxillary and mandibular incisors coincided with each other at 7 weeks of age. However, in the removal and continuation groups, the maxillary midline was displaced toward the left and that of the mandibular incisors was displaced toward the right along with right displacement of the mandible (Fig. 5 ). Observations of 3D images also revealed lingual inclination of the mandibular molars on the elevated side (Fig. 2 ). Left–right comparisons in the control group showed no significant differences in any craniometric parameters at 5, 7, and 9 weeks of age (Table 1). Left–right comparisons in the removal group also showed no significant difference in any craniometric parameters at 5 weeks of age, before unilateral occlusal elevation. At 7 weeks of age (after unilateral occlusal elevation) significant differences were noted in all the investigated parameters (p < 0.05). 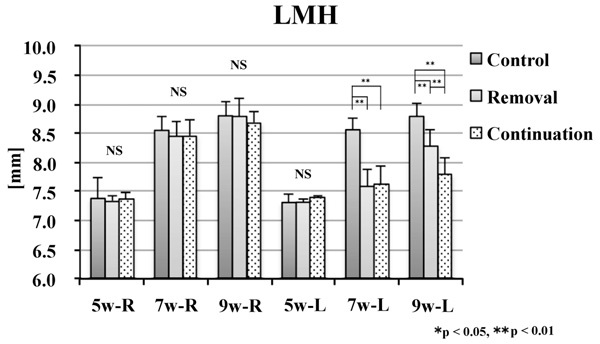 At 9 weeks of age, no significant differences were observed between any craniometric parameters other than LMH (Table 2). Left–right comparisons in the continuation group showed no significant difference in any craniometric parameters at 5 weeks of age, before unilateral occlusal elevation. At 7 weeks of age, after unilateral occlusal elevation, significant differences were evident in all the parameters investigated. At 9 weeks of age, significant differences were also evident in all the parameters investigated (p < 0.01; Table 3). 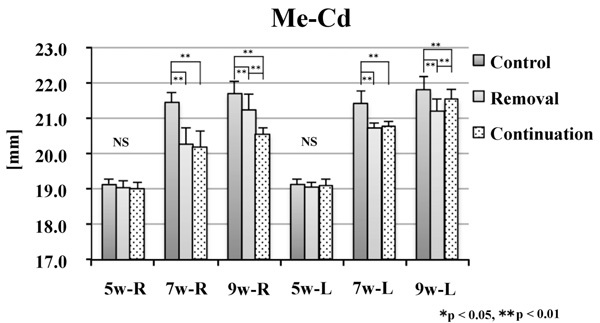 A large right–left difference in Me–Cd was evident at 9 weeks of age in the continuation group (Me–Cd at 9 weeks of age in the continuation group: R = 20.57 ± 0.19, L = 21.54 ± 0.27, p < 0.01; Table 3). Left–right comparison within the removal group (n = 10). Left–right comparison within the continuation group (n = 10). No significant difference was noted in the alveolar craniometric parameters LMH or UMH at 5 weeks of age. At 7 and 9 weeks of age, the values on the left side were significantly smaller in the removal and continuation groups than those in the control group (p < 0.01). At 9 weeks of age, the values on the left side were significantly larger in the continuation group than those in the removal group (p < 0.01; Figs. 6 and 7 ). Comparison of left and right LMH at each age between the three groups. Comparison of left and right UMH at each age between the three groups. There was no significant difference between groups in CdH or Me–Cd at 5 weeks of age. At 7 weeks of age, the values on the right side were significantly smaller in the removal and continuation groups than those in the control group (p < 0.01). On the left side, the values of Me–Cd were significantly smaller in the removal and continuation groups than those in the control group (p < 0.01). At 9 weeks of age, the values on the right side were significantly different between the three groups (p < 0.01). On the left side, the values were significantly smaller in the removal and continuation groups than those in the control group (p < 0.01). Moreover, on the left side, the values were significantly larger in the continuation group than those in the removal group (p < 0.05; Figs. 8 and 9 ). There was no significant difference in weight gain at any time point in each group. Therefore, the involvement of dietary intake was rejected (Fig. 10 ). Unilateral occlusal elevation during the growth phase causes facial asymmetry by influencing teeth eruption and mandibular articular process growth. However, it was suggested that when the primary bite raise is removed, the growth is similar to that in the control group. Four week old male rats used in this study were evaluated at 5, 7 and 9 weeks of age. However, to allow the adaptation of the rats post-weaning to the test environment, to evaluate the growth state from their average body weight, and to exclude abnormal rats from the study, we allowed the rats to acclimatize for another week. Thereafter, they were used in the experiment. Therefore, the rats used in experiments aged 5 weeks. This age group was selected because the distance between the left and right mandibular condyles, which reflects the growth of the cranium and temporal bones, becomes almost constant at 4 weeks of age. However, the distance between the mandibular condyle and mandibular angle rapidly increases until 10 weeks of age [21Suda D, Ohazama A, Maeda T, Kobayashi T. The effect of bone mass and architecture on mandibular condyle after mandibular distraction. Oral Surg Oral Med Oral Pathol Oral Radiol 2017; 124(4): 339-47. [http://dx.doi.org/10.1016/j.oooo.2017.05.472] [PMID: 28864292] , 22Lezón CE, Pintos PM, Bozzini C, et al. Mechanical mandible competence in rats with nutritional growth retardation. Arch Oral Biol 2017; 80: 10-7. [http://dx.doi.org/10.1016/j.archoralbio.2017.03.009] [PMID: 28363 114] ]. In addition, there are few effects from hormones and the estrus cycle during this period [23Ngadjui E, Watcho P, Nguelefack TB, Kamanyi A. Effects of Ficus asperifolia on normal rat estrus cyclicity. Asian Pac J Trop Biomed 2013; 3(1): 53-7. [http://dx.doi.org/10.1016/S2221-1691(13)60023-4] [PMID: 23570 017] , 24Yasuoka T, Nakashima M, Okuda T, Tatematsu N. Effect of estrogen replacement on temporomandibular joint remodeling in ovariectomized rats. J Oral Maxillofac Surg 2000; 58(2): 189-96. [http://dx.doi.org/10.1016/S0278-2391(00)90337-9] [PMID: 10670 598] ]. The rats were normally reared for 1 week to enable their adaptation to the study environment, as well as to assess the growth status from their mean weight and exclude any abnormal rats from the study. Comparison of left and right CdH at each age between the three groups. Comparison of left and right Me-Cd at each age between the three groups. In this study, unilateral occlusal elevation was performed by affixing a metal buccal tube, commonly used in orthodontic treatment, to the left upper molars. The metal buccal tube used in this study was composed of a standard material of appropriate size. The metal bracket tube is distinguished in terms of controllability, adhesion, and biocompatibility, which makes it a preferred device for clinical orthodontic treatment. In the preliminary experiment, although a resin-based material was worn down by the occlusal force, the metal bracket tube did not show any signs of wear or transformation. In terms of craniometric parameters, Cd was used as the craniometric point for the mandibular process because it was chosen as the site of morphological measurements in numerous other studies [20Ishii T, Yamaguchi H. Influence of extraoral lateral force loading on the mandible in the mandibular development of growing rats. Am J Orthod Dentofacial Orthop 2008; 134(6): 782-91. [http://dx.doi.org/10.1016/j.ajodo.2006.10.032] [PMID: 19061805] ]. Cd is the most developed of the three mandibular points, and Me–Cd passes through the center of the mandible, making it the most suitable point for determining mandibular length. The mesiobuccal cusp of the second molar was used to measure (LMH and UMH) because it is not a free end and has a small mesial slope. Additionally, a slight bias was noted regarding the effect of the device owing to the use of the middle molar. CT enables the acquisition of 3D images with no distortion or expansion [21Suda D, Ohazama A, Maeda T, Kobayashi T. The effect of bone mass and architecture on mandibular condyle after mandibular distraction. Oral Surg Oral Med Oral Pathol Oral Radiol 2017; 124(4): 339-47. [http://dx.doi.org/10.1016/j.oooo.2017.05.472] [PMID: 28864292] , 25Matta RE, von Wilmowsky C, Neuhuber W, et al. The impact of different cone beam computed tomography and multi-slice computed tomography scan parameters on virtual three-dimensional model accuracy using a highly precise ex vivo evaluation method. J Craniomaxillofac Surg 2016; 44(5): 632-6. [http://dx.doi.org/10.1016/j.jcms.2016.02.005] [PMID: 27017101] ], and micro-CT was used in this study considering the small size of rats [12Nakano H, Watahiki J, Kubota M, et al. Micro X-ray computed tomography analysis for the evaluation of asymmetrical condylar growth in the rat. Orthod Craniofac Res 2003; 6(Suppl. 1): 168-72. [http://dx.doi.org/10.1034/j.1600-0544.2003.252.x] [PMID: 14606 552] , 13Nakano H, Maki K, Shibasaki Y, Miller AJ. Three-dimensional changes in the condyle during development of an asymmetrical mandible in a rat: A microcomputed tomography study. Am J Orthod Dentofacial Orthop 2004; 126(4): 410-20. [http://dx.doi.org/10.1016/j.ajodo.2004.04.016] [PMID: 15470344] , 21Suda D, Ohazama A, Maeda T, Kobayashi T. The effect of bone mass and architecture on mandibular condyle after mandibular distraction. Oral Surg Oral Med Oral Pathol Oral Radiol 2017; 124(4): 339-47. [http://dx.doi.org/10.1016/j.oooo.2017.05.472] [PMID: 28864292] ]. As only a short imaging time is required to observe the mandibular growth and changes in the molar region in the same individual over time, the use of micro-CT that could perform craniofacial scanning under sedation was an essential requirement. A left–right comparison of the skeletal craniometric parameters for CdH and Me–Cd in the removal and continuation groups at 7 weeks of age showed that these parameters were significantly larger on the elevated side. A comparison between the three groups at 7 weeks of age also revealed a significant difference between the control group and the other two groups but no significant difference between the removal and continuation groups. This suggests that in skeletal terms, unilateral occlusal elevation for 2 weeks increased the height of the mandibular ramus on the elevated side, extended the mandibular length through anterior mandibular growth, and displaced the midline toward the unelevated side, generating significant differences in skeletal craniometric parameters and causing facial asymmetry. In other words, the bias in occlusal force on the elevated side resulted in unilateral occlusion. Moreover, the left–right difference in occlusal height imposed a force that pulled the mandibular condyle on the elevated side, which may have resulted in preferential bone addition to the mandibular condyle on the elevated side. This is in agreement with numerous previous experiments that showed that when either the left or right mandibular condyle is pulled out of the mandibular fossa, endochondral ossification of the mandibular condyle increases on the side that has been pulled out after a certain period of time [10Fuentes MA, Opperman LA, Buschang P, Bellinger LL, Carlson DS, Hinton RJ. Lateral functional shift of the mandible: Part I. Effects on condylar cartilage thickness and proliferation. Am J Orthod Dentofacial Orthop 2003; 123(2): 153-9. [http://dx.doi.org/10.1067/mod.2003.5] [PMID: 12594421] , 26Utreja A, Dyment NA, Yadav S, et al. Cell and matrix response of temporomandibular cartilage to mechanical loading. Osteoarthritis Cartilage 2016; 24(2): 335-44. [http://dx.doi.org/10.1016/j.joca.2015.08.010] [PMID: 26362410] , 27Betti BF, Everts V, Ket JCF, et al. Effect of mechanical loading on the metabolic activity of cells in the temporomandibular joint: A systematic review. Clin Oral Investig 2018; 22(1): 57-67. [http://dx.doi.org/10.1007/s00784-017-2189-9] [PMID: 28761983] ]. Skeletal changes involving the lateral displacement of the mandible indicated by left–right differences in height of the mandibular ramus and mandibular length were also similar to the results of the experiments in which the mandible was laterally displaced by fitting an inclined plate to the incisors [7Veli I, Uysal T, Ozer T, Ucar FI, Eruz M. Mandibular asymmetry in unilateral and bilateral posterior crossbite patients using cone-beam computed tomography. Angle Orthod 2011; 81(6): 966-74. [http://dx.doi.org/10.2319/022011-122.1] [PMID: 21591969] , 10Fuentes MA, Opperman LA, Buschang P, Bellinger LL, Carlson DS, Hinton RJ. Lateral functional shift of the mandible: Part I. Effects on condylar cartilage thickness and proliferation. Am J Orthod Dentofacial Orthop 2003; 123(2): 153-9. [http://dx.doi.org/10.1067/mod.2003.5] [PMID: 12594421] -13Nakano H, Maki K, Shibasaki Y, Miller AJ. Three-dimensional changes in the condyle during development of an asymmetrical mandible in a rat: A microcomputed tomography study. Am J Orthod Dentofacial Orthop 2004; 126(4): 410-20. [http://dx.doi.org/10.1016/j.ajodo.2004.04.016] [PMID: 15470344] ] or by fitting an inclined plate to the molar region [5Rodrigues VP, Freitas BV, de Oliveira ICV, Dos Santos PCF, de Melo HVF, Bosio J. Tooth loss and craniofacial factors associated with changes in mandibular condylar morphology. Cranio 2018; 29: 1-7. [PMID: 29376479] , 6Wattanachai T, Yonemitsu I, Kaneko S, Soma K. Functional lateral shift of the mandible effects on the expression of ECM in rat temporomandibular cartilage. Angle Orthod 2009; 79(4): 652-9. [http://dx.doi.org/10.2319/080808-417.1] [PMID: 19537875] ]. The alveolar craniometric parameters LAH, LMH, and UMH were smaller on the elevated side, and a comparison between the three groups showed a significant difference at 7 weeks of age between the control group and the two other groups. This may have been caused by dental changes, such as the restricted molar eruption on the elevated side and molar extrusion on the unelevated side. Unilateral occlusal interference suppressed the eruption of the molars on the elevated side; however, there was clearance between the upper and lower occlusal surfaces of the molars on the unelevated side, indicating that these molars were able to erupt. The results of these dental changes are similar to those of studies in which a splint was fitted to the molar region [5Rodrigues VP, Freitas BV, de Oliveira ICV, Dos Santos PCF, de Melo HVF, Bosio J. Tooth loss and craniofacial factors associated with changes in mandibular condylar morphology. Cranio 2018; 29: 1-7. [PMID: 29376479] , 6Wattanachai T, Yonemitsu I, Kaneko S, Soma K. Functional lateral shift of the mandible effects on the expression of ECM in rat temporomandibular cartilage. Angle Orthod 2009; 79(4): 652-9. [http://dx.doi.org/10.2319/080808-417.1] [PMID: 19537875] ]. In the experimental results at 9 weeks of age, a left–right comparison showed that the number of parameters showing a significant left–right difference was lower in the removal group, indicating amelioration of asymmetry. In the continuation group; however, there was a significant left–right difference in all parameters. 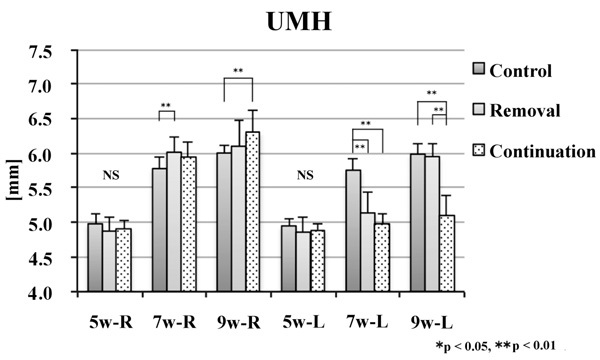 A comparison between the groups revealed that UMH was the only parameter for which a significant difference between the removal and control groups was no longer evident. However, the number of parameters with a significant difference between the removal and continuation groups had increased. 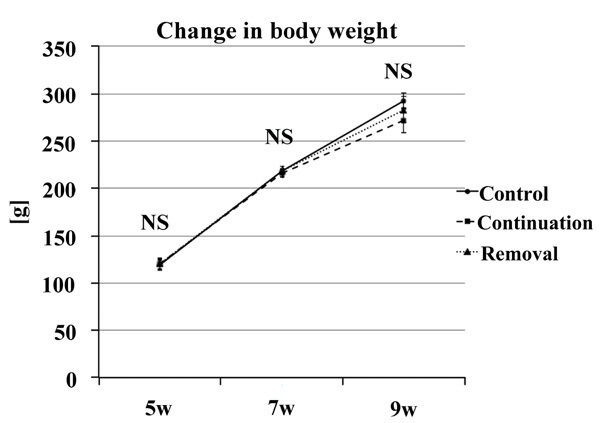 This suggested that the growth pattern of the removal group differed from that of the continuation group after 7 weeks of age, indicating growth that ameliorated asymmetry. This can be attributed to the fact that in the removal group, the elevated side had an open bite because of the suppression of molar eruption after removing the device, resulting in unilateral occlusion on the unelevated side alone, reversing the experimental environment of the left unilateral occlusal elevation that had been present at 5 weeks of age, and creating an environment of occlusal interference in the right molar area. Under these circumstances, the suppression of molar eruption on the unelevated side and displacement of the mandible toward the elevated side may have occurred. This mechanism can be interpreted as the application of the same effect as when the device was fitted, but acting in the opposite direction, and this is consistent with findings of the reports on the suppression of molar eruption [28Tehranchi A, Behnia H. Treatment of mandibular asymmetry by distraction osteogenesis and orthodontics: A report of four cases. Angle Orthod 2000; 70(2): 165-74. [PMID: 10833006] , 29Turkkahraman H, Cetin E. Comparison of two treatment strategies for the early treatment of an anterior skeletal open bite : Posterior bite block-vertical pull chin cup (PBB-VPC) vs. posterior bite block-high pull headgear (PBB-HPH). J Orofac Orthop 2017; 78(4): 338-47. [http://dx.doi.org/10.1007/s00056-017-0095-z] [PMID: 28488080] ] and mandibular lateral displacement [5Rodrigues VP, Freitas BV, de Oliveira ICV, Dos Santos PCF, de Melo HVF, Bosio J. Tooth loss and craniofacial factors associated with changes in mandibular condylar morphology. Cranio 2018; 29: 1-7. [PMID: 29376479] -7Veli I, Uysal T, Ozer T, Ucar FI, Eruz M. Mandibular asymmetry in unilateral and bilateral posterior crossbite patients using cone-beam computed tomography. Angle Orthod 2011; 81(6): 966-74. [http://dx.doi.org/10.2319/022011-122.1] [PMID: 21591969] , 10Fuentes MA, Opperman LA, Buschang P, Bellinger LL, Carlson DS, Hinton RJ. Lateral functional shift of the mandible: Part I. Effects on condylar cartilage thickness and proliferation. Am J Orthod Dentofacial Orthop 2003; 123(2): 153-9. [http://dx.doi.org/10.1067/mod.2003.5] [PMID: 12594421] -13Nakano H, Maki K, Shibasaki Y, Miller AJ. Three-dimensional changes in the condyle during development of an asymmetrical mandible in a rat: A microcomputed tomography study. Am J Orthod Dentofacial Orthop 2004; 126(4): 410-20. [http://dx.doi.org/10.1016/j.ajodo.2004.04.016] [PMID: 15470344] ]. Dental changes observed in the removal group at 7 weeks of age included an open molar bite on the elevated side and occlusal friction on the unelevated side, resulting in the amelioration of asymmetry of the jaw and suppression of molar eruption on the unelevated side. The slope of the occlusal surface on the elevated side also ameliorated because of the suppression of the eruption of molars. The skeletal changes observed at 7 weeks of age, such as an increase in the height of the mandibular ramus on the unelevated side, the extension of the mandibular length on the elevated side as a result of anterior growth of the mandible, and the displacement of the midline toward the unelevated side, were reversed by skeletal changes such as an increase in the height of the mandibular ramus on the unelevated side, the extension of the mandibular length on the elevated side due to the anterior growth of the mandible, and the displacement of the midline toward the unelevated side. The dental changes observed in this study were due to the suppression of molar eruption on the elevated side and molar extrusion on the unelevated side. These results were consistent with those of studies that reported that hybrid appliances are effective for controlling molar height and ameliorating the occlusal plane [28Tehranchi A, Behnia H. Treatment of mandibular asymmetry by distraction osteogenesis and orthodontics: A report of four cases. Angle Orthod 2000; 70(2): 165-74. [PMID: 10833006] ] and that a posterior bite block of the maxillary molar region acts to control vertical growth and is effective in creating an open bite in the incisor region [29Turkkahraman H, Cetin E. Comparison of two treatment strategies for the early treatment of an anterior skeletal open bite : Posterior bite block-vertical pull chin cup (PBB-VPC) vs. posterior bite block-high pull headgear (PBB-HPH). J Orofac Orthop 2017; 78(4): 338-47. [http://dx.doi.org/10.1007/s00056-017-0095-z] [PMID: 28488080] ]. The pattern of movement of this molar is similar to the movement of teeth due to corrective forces. Moreover, it is assumed that this tooth emerged without any load on tooth reduction due to a strong occlusal force and the occlusal force of the opposing tooth [30Isola G, Matarese G, Cordasco G, Perillo L, Ramaglia L. Mechanobiology of the tooth movement during the orthodontic treatment: A literature review. Minerva Stomatol 2016; 65(5): 299-327. [PMID: 27580655] ]. With respect to the induction of skeletal growth, our results suggest that the type of functional orthodontic appliances used in our experiment can also be used in the molar region to displace the mandible toward the unelevated side. This finding is consistent with that of reports on mandibular lateral displacement [5Rodrigues VP, Freitas BV, de Oliveira ICV, Dos Santos PCF, de Melo HVF, Bosio J. Tooth loss and craniofacial factors associated with changes in mandibular condylar morphology. Cranio 2018; 29: 1-7. [PMID: 29376479] -7Veli I, Uysal T, Ozer T, Ucar FI, Eruz M. Mandibular asymmetry in unilateral and bilateral posterior crossbite patients using cone-beam computed tomography. Angle Orthod 2011; 81(6): 966-74. [http://dx.doi.org/10.2319/022011-122.1] [PMID: 21591969] , 10Fuentes MA, Opperman LA, Buschang P, Bellinger LL, Carlson DS, Hinton RJ. Lateral functional shift of the mandible: Part I. Effects on condylar cartilage thickness and proliferation. Am J Orthod Dentofacial Orthop 2003; 123(2): 153-9. [http://dx.doi.org/10.1067/mod.2003.5] [PMID: 12594421] -13Nakano H, Maki K, Shibasaki Y, Miller AJ. Three-dimensional changes in the condyle during development of an asymmetrical mandible in a rat: A microcomputed tomography study. Am J Orthod Dentofacial Orthop 2004; 126(4): 410-20. [http://dx.doi.org/10.1016/j.ajodo.2004.04.016] [PMID: 15470344] ]. Functional problems such as early interference of molars result in asymmetric growth of the maxillofacial face. However, if these problems are treated early in the growth stage, normal growth of the maxillofacial face can be observed, but the persistent nature of this problem suggests asymmetric maxillofacial growth. Unilateral occlusal elevation during the growth period results in the suppression of molar eruption on the elevated side and molar extrusion on the unelevated side in alveolar terms. Skeletally, The height of the mandibular ramus increases on the elevated side, resulting in asymmetric growth. If unilateral occlusal elevation is maintained for a certain period of time and is then removed, skeletal asymmetry decreases. However, in alveolar terms, the suppression of extrusion on the unelevated side and of elongation on the elevated side results in the correction of the inclination of the occlusal plane. This study was approved by the Ethical committee of the Tokyo Dental College (approval no. 23202). No humans were used for studies that are the basis of this research. All animal experiments were conducted in accordance with the Guidelines for the Treatment of Experimental Animals at the Tokyo Dental College (approval no. 23202). The study was supported by a grant from the Tokyo Dental College. This research was funded by Tokyo Dental College. 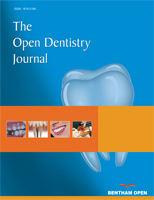 The authors would like to thank the entire staff of the Department of Orthodontics, Tokyo Dental College. The authors would like to thank Enago (www.enago.jp) for the English language review. Nonaka K, Yanagishita K, Matumoto T, Otani H, Sasaki Y, Nakata M. Genetic study of the mandibular size and shape in rats. Pediatr Dent 1991; 1: 27-35. "Thank you for your magnificent and marvelous support throughout the publication stages. I would like to endorse my experience with you as a Junior Researcher and a recent graduate of the Dental school. Once again Thank you for your Great Help and Guidance throughout the stages of Publication. You guys are a great team and I am proud to be a Young Bentham author." "My experience with Bentham Open was a valuable one because the quality of the services and analysis of my paper contributed in improving what we intended to convey to the readers." "The Publication Manager was very cooperative and replied my mails and guided me without any delays; however the reviewing process was too long."